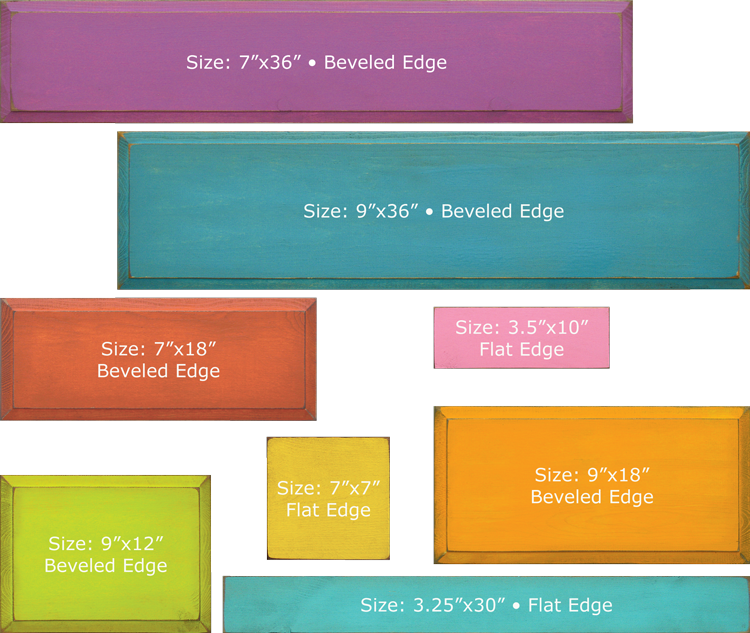 We use quality water-based paints in over 40 colors. Our "Solid" finish is two coats of paint, and our "Old" finish is one coat of paint, with the edges sanded and a stain applied overall to give a warm rustic look. Furniture is available in both solid and old finishes, and signs are made standard in our old finish. Solid signs are available on special request for an extra charge. Both signs and furniture can also be ordered just stained, in either our Butternut (light) stain, or our Walnut (dark) stain. Please note: We have done our best to make our swatches accurate, however, color can vary depending on the device you use to view our site. For the most accurate samples, you can request physical color chips, call 800-717-3031 for details. We can make custom sign sizes. Contact us at 800-717-3031 for info.